Disclosure: Evanger's sent canned dog food and treats to Lapdog Creations, free of charge for review purposes. I was not compensated for this review and all opinions expressed are my own. Plus, their tagline - "Real People Food For Pets!" - certainly caught my eye, as did "Fresh Local Daily!" All Evanger's foods are made with human-grade, highly palatable ingredients of which 90% are sourced within 50 miles of their kitchens. While the Evanger family no longer owns the company, it does remain a family-owned and operated business thanks to the Sher family who purchased it in 2003. Their expanded food line is still manufactured on the original site, in the same tradition of uncompromising quality. 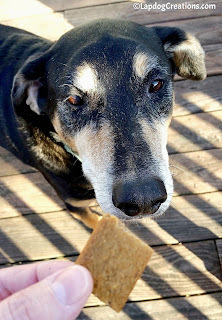 While the Lapdogs wanted to get their paws on the treats first - after all every little bag that makes even the slightest crinkly noise must be full of T-R-E-A-T-S for them - I was more anxious to pop open one of the canned meals. 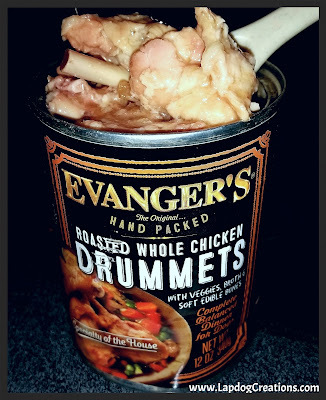 We use canned food as a mix-in at dinner time and I am always looking for new options to add to our rotation. Evanger's not only fit right in, they surpassed my expectations! 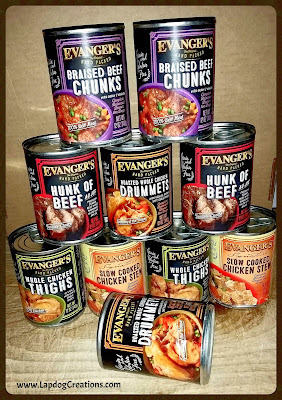 Evanger's canned meals are free of wheat, corn and soy, as well as artificial ingredients, preservatives and by-products. But the thing that really sets them apart from the rest is their innovative manufacturing process. 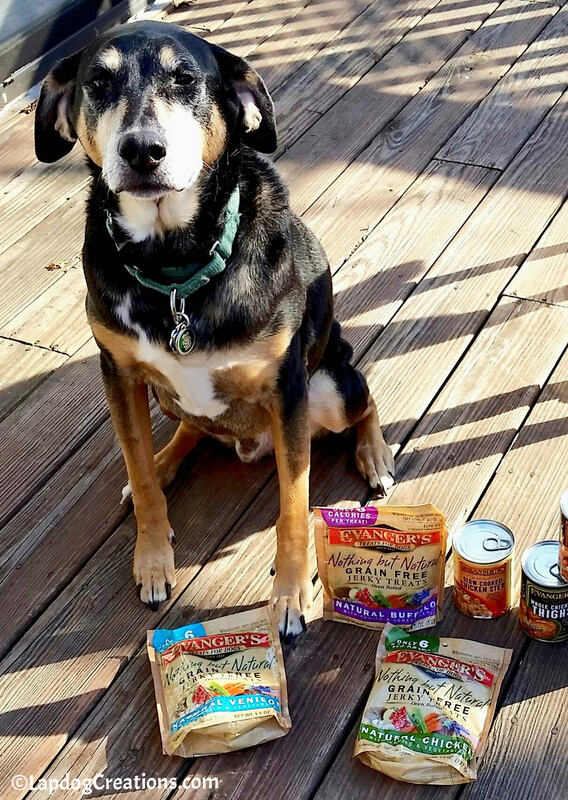 In 2003, Evanger's became the first pet food company to create a food that was packed by hand instead of machine. And, all of Evanger's cans are packed with raw ingredients in their own natural juices. The meals are then cooked entirely inside the sealed can to lock in the nutrients and flavors. We received the Slow Cooked Chicken Stew, as well as four flavors from the Whole Meat Chunks in Gravy line: Braised Beef Chunks, Hunk of Beef, Whole Chicken Thighs, and Roasted Whole Chicken Drummets. I wish I could show you how much the Lapdogs loved these tasty, home-cooked looking meals through photos, but they were gobbling them up so fast, everything was a blur! In addition to the canned meals, we received some of the Grain Free Oven Baked Jerky in three drool-worthy flavors: Natural Venison, Natural Chicken and Natural Buffalo. These semi-moist Jerky Treats can be fed as a snack, between meals, or used during training (they can easily be broken into smaller pieces). Real meat is the number one ingredient, and there are no artificial colors or flavors. 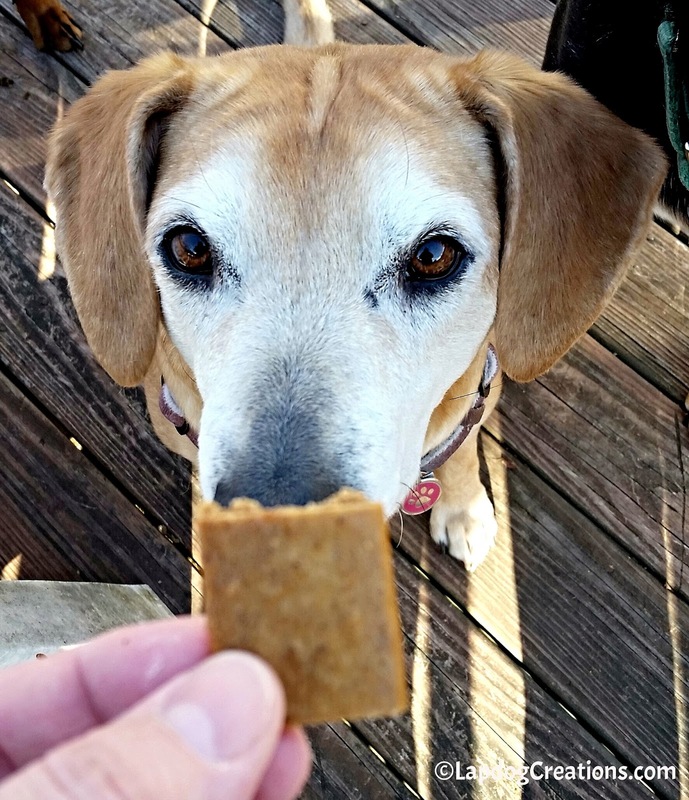 At just 6 calories per treat, you won't feel guilty giving an extra treat - or two - to your pack! We will be adding Evanger's canned meals and treats to our regular rotation. The Lapdogs highly recommend that you treat your favorite furbabies to these tasty dinners and treats as well. And that goes for the whole furry family - in addition to great dog food and treats, Evanger's also makes cat and ferret food! My boys eat Evanger's duck and sweet potato mixed into their kibble every night. We love it. I recently bought their bacon food as a special treat for the girls. Needless to say, there were no complaints. I feel safe and confident feeding Evanger's. I do like the tagline "People Food For Pets!" So glad the Lapdogs taste tested and approved. It must be fun for them to get variety in their diets. I had not heard of this brand before, thanks for your review. I love that the ingredients are sourced from the USA. 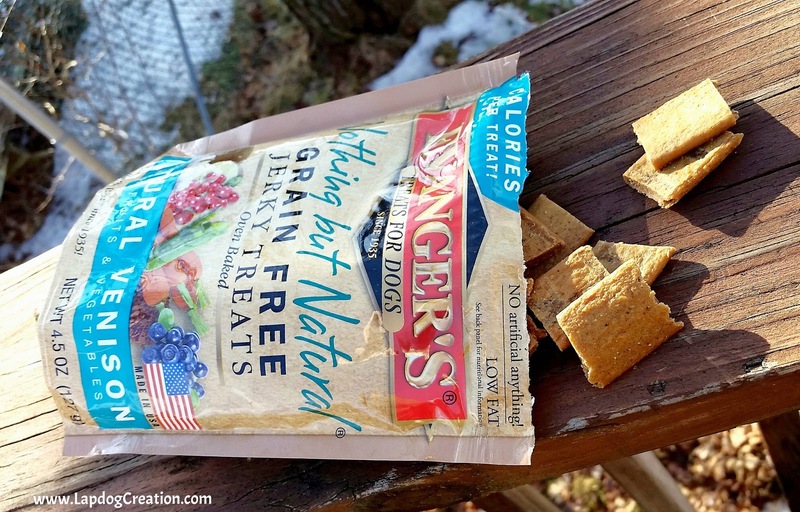 I think my dogs would love the grain free treats! 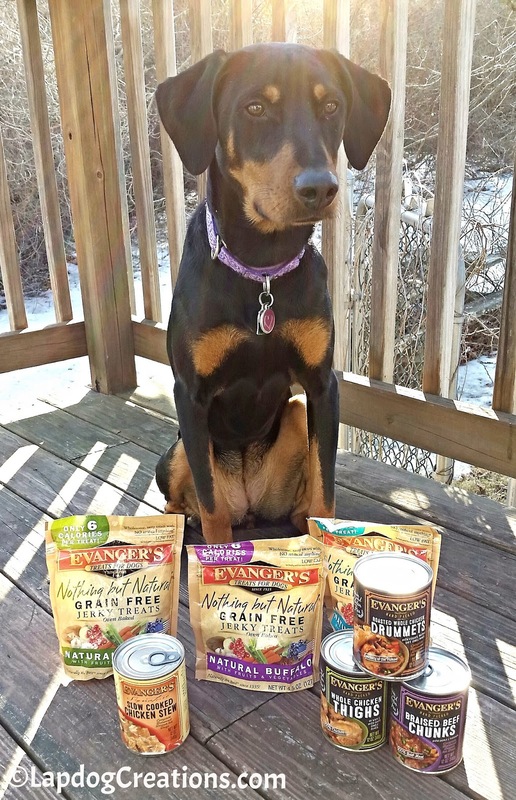 Evangers makes some great pet foods! My cats have loved the foods they have tried from them. Those dog foods look great too! The quality of the food is excellent. I think I have seen this brand before. Henry and Reese believe they SHOULD eat what we eat (my husband more so as he eats meat). 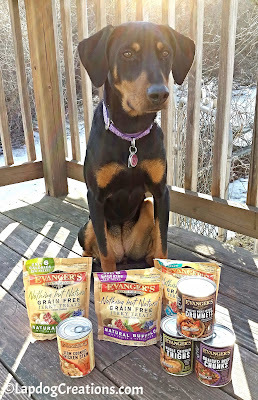 We love Evangers variety of good dog foods - we try them every now and then, and have them during the holidays, etc.! Good product and great review! I'm starting to hear more and more about this particular brand. Enjoy! 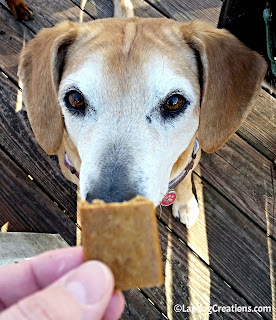 I am always looking for good canned food for Gracie's kong. I might have to try this out! Looks good! Not heard much about Evangers, maybe we should check it out. Just to let you know they did have a voluntary recall on one type of their beef canned food in the last week (February 2017). I included 5 lot numbers and by the sounds of it some risky chemicals as well. Bunnies and Tantrums and Spring Cleaning - Oh My!